NATIONAL HARBOR, Maryland: For ten consecutive years, children of Indian origin have won the prestigious and exceedingly popular Scripps National Spelling Bee and now several kids are at the scenic National Harbor to compete in the 91st edition of an event on which their predecessors have stamped an indelible imprint. Over the Memorial Day weekend, 516 word whizzes, including more than 150 (30 percent) of Indian descent, headed to the Gaylord Resort and Convention Center that has served as the venue of the competition for eight years. It is the largest number of spellers in the Bee’s history, significantly more than in 2017 when there were 291. The contestants comprise 239 girls (46 percent) and 277 boys, ranging in age from 8 to 15 years with the majority (85 percent) being 12 to 14 years old. They emerged from an original pool of over 11 million spellers who competed in local or regional bees held in all 50 US states, the District of Columbia, US territories, Department of Defense Schools in Europe and eight other countries: the Bahamas, Canada, Ghana, Italy, Jamaica, Japan, South Korea and the United Kingdom. Incidentally, the youngest speller is an Indian American, Akash Vukoti of San Angelo, Texas, a celebrity or ‘spellebrity’ as these kids are called. The wonder child spelt his first word ‘Spoon’ at the age of 1.5 years. At 6, he was the youngest finalist of the 2016 Scripps National Spelling Bee. At the time, we asked him how he felt competing with kids as old as 15. Akash, who loves to entertain people, replied, “I’m ready to get those 15-year-olds out of the way”. Then thoughtfully he added, “I’m not trying to get past the 15-year-olds. I’m trying to get past the dictionary. The dictionary is the thing that you compete with”, he told us. The crowd erupted in cheers when he correctly spelled ‘inviscate’ in the preliminaries. Even when he bowed out of the competition, misspelling the word ‘bacteriolytic’ by using an ‘a’ rather than an ‘o’ in the middle, Akash remained a scene stealer vowing to come back. He did, this year through the RSVBee selection process. The record number of spellers has resulted from the introduction of an invitational program, RSVBee, which allows more champion spellers to compete at the national level. So, along with the 278 regional bee winners who qualified via the traditional route, an additional 238 spellers have been selected — those who aced their school spelling bee or were a former national finalist attending a school which is enrolled in the Bee program — to compete in the finals. “To welcome more spellers than ever to compete exemplifies the evolution of our program and the vast interest from families across the country”, said Paige Kimble, executive director of the Scripps National Spelling Bee. “With RSVBee, we are leveling the playing field for national finals qualification and providing more opportunities for students to experience all the thrills, friendships and memories that come from the event”. She added, “Bee Week is a special experience that challenges the mind and warms the heart”. The purpose of the Bee is to help students improve their spelling, increase their vocabularies, learn concepts and develop correct English usage that will help them all their lives. It is noteworthy that 45 spellers in the current competition have relatives who previously participated in Scripps Spelling Bees including Indian American Atman Balakrishnan, 12, of Chicago, whose father Balu Natarajan is the 1985 champion. Both Akash and Natarajan star in ‘Breaking the Bee’, an acclaimed documentary that explores the two-decade mastery by Indian Americans over the Scripps National Spelling Bee. By correctly spelling ‘Marocain’ (a ribbed crepe fabric made of silk, wool or rayon), Ananya Vinay, 12, of California was crowned champion of the 2017 contest and awarded the top prize of $40,000. Not only did she compete against another Indian American speller, Rohan Rajeev, 14, of Oklahoma, the majority (13 out of 15) of finalists were of Indian origin. 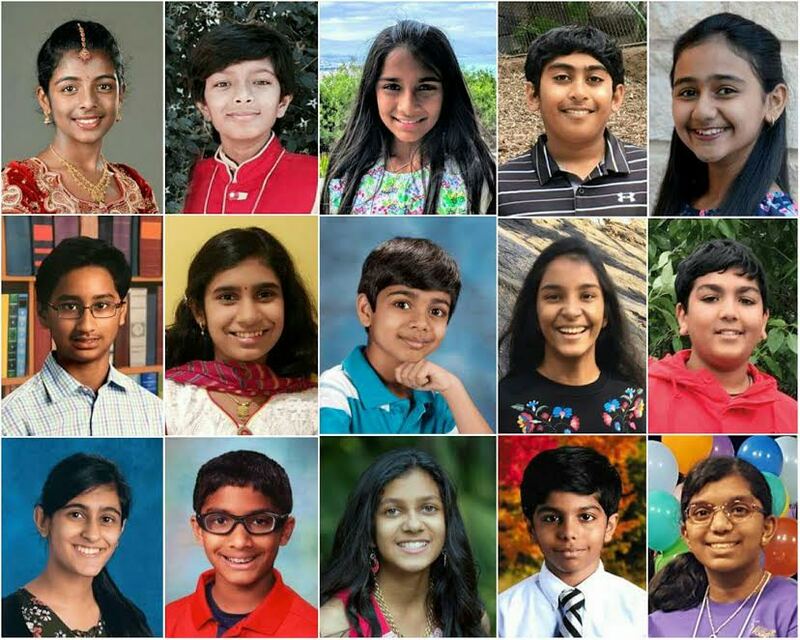 Following the 2017 edition, Indian American kids have won the acclaimed competition for all but four of the last eighteen years. The preceding three years saw the winners in a tie: Jairam Hathwar and Nihar Janga (2016); Vanya Shivashankar and Gokul Venkatachalam (2015); Sriram Hathwar (Jairam’s older brother) and Ansun Sujoe (2014). All the winners emerged out of an original pool of millions of spellers. The statistics are mind-boggling given the fact that Americans of Indian descent constitute barely one percent of the US population. At a press conference last year, Kimble addressed queries about the children of recent immigrants excelling at the competition. “What we see, a common thread among children who are first generation, second generation Americans, in their homes, is an intense focus on educational achievement”, she told journalists. “They see this as a recognition opportunity, a great opportunity, and they pursue it”. Citing a statistic released by the British Council, Kimble noted that by 2020, it is expected that there will be two billion English language learners or speakers worldwide, and only about 350 million of those will be in the United States. “So, there are a lot of people all over the world, many more than in the United States, playing with the English language as they learn it and as they speak it”, she said. “One of the oldest, most familiar games that you can play as an English language speaker is spelling and spelling bees. I think it is natural that as people everywhere learn the language, they play with the game of spelling. It’s just so accessible for them”. Responding to a question about the ability and caliber of the spellers, Dr. Jacques Bailly, official pronouncer at the Bee and a former champion (1980), admitted, “We are constantly surprised. It’s obvious they are amazing. They are getting better and better”, he said, likening the Bee to the Olympics which keeps drawing a wider audience and attracts finer competitors. Interestingly, the Scripps Bee is called the Olympics of Spelling. The 2018 championship event will be telecast on Thursday, May 31, beginning at 8:30 pm, on ESPN which will be broadcasting the competition for the 25th consecutive year.